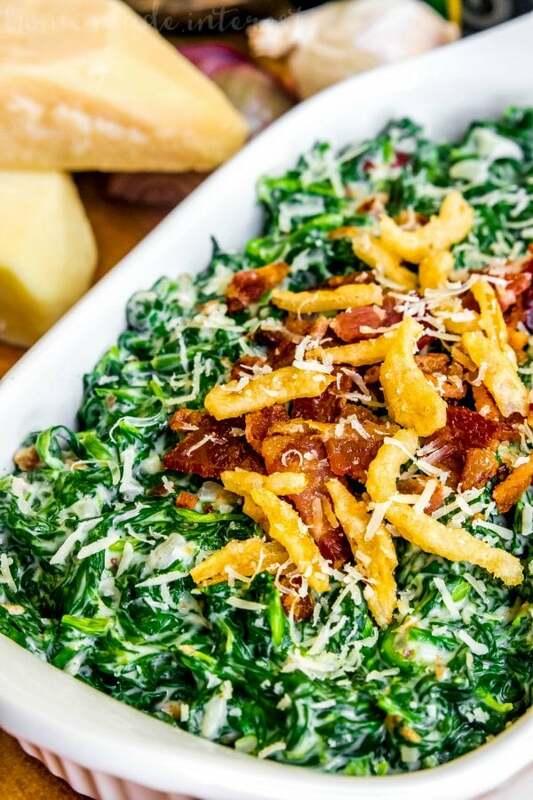 Creamed Spinach with Bacon - Home. Made. Interest. 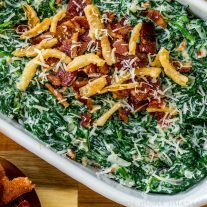 This Creamed Spinach with Bacon recipe is a traditional creamed spinach recipe taken to the next level with crisp bacon and gooey cheese. I love the holidays. They are all about getting together with family, spending time together, and, if you’re anything like my family, lots and lots of food! Personally my favorite part of any holiday meal are the sides. I bet you thought I was going to say dessert didn’t you? The truth is a good Thanksgiving side like Creamed Spinach with Bacon beats a pumpkin pie any day. This Creamed Spinach with Bacon is my own recipe.I consider myself a bit of a creamed spinach connoisseur. If it’s on a menu then you can be sure I’m ordering it. I have this restaurant I love to go to that has amazing steaks and the best creamed spinach! With Thanksgiving dinner and Christmas dinner just around the corner I’ve been playing around with different versions of creamed spinach trying to reproduce theirs and what I end up with was even better. Love it when that happens! 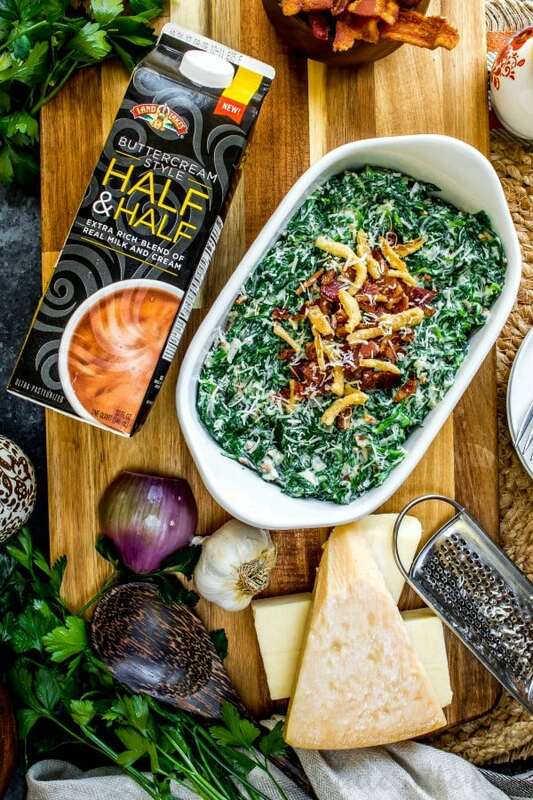 Creamed Spinach is all about rich, creamy sauce and the key to mine is using half & half. I recently discovered Land O’Lakes® Buttercream Style Half & Half in the dairy section at Walmart when I was picking up half & half for my morning coffee. It’s an extra rich blend of real milk and cream that was so good in my coffee it made me wonder if it would work in my creamed spinach recipe. It turned out sooo good! The extra richness from the cream in Land O’Lakes® Buttercream Style Half & Half makes the creamy, cheesy sauce for my Creamed Spinach with Bacon totally decadent. 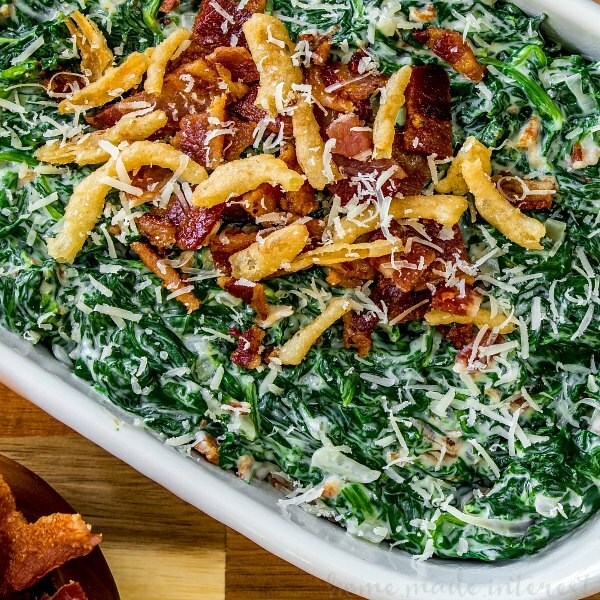 This easy Creamed Spinach with Bacon is a simple side dish that is perfect for the holidays. Steam fresh baby spinach until wilted and tender. Squeeze all of the excess liquid from the spinach. In a skillet over medium heat melt butter then add shallots and garlic and cook for 2-3 minutes until shallots become translucent. Slowly add the half & half, whisking continuously until the sauce begins to thicken, 3-5 minutes. Stir in white cheddar cheese and Parmesan cheese. Dice up 4 of the bacon strips and add to the cheese sauce. Stir until the cheese has melted. 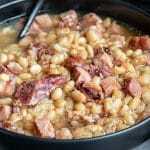 Serve immediately with a garnish of the last two slices of bacon chopped, and crispy fried onions. 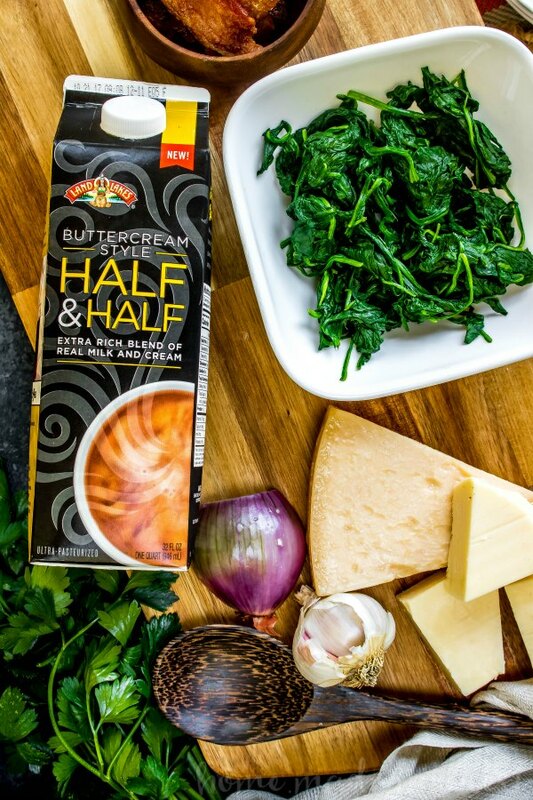 Whether it is an extra rich, extra creamy, perfect morning coffee or an awesome Creamed Spinach with Bacon make sure you experience new Land O’Lakes® Buttercream Style Half & Half yourself. 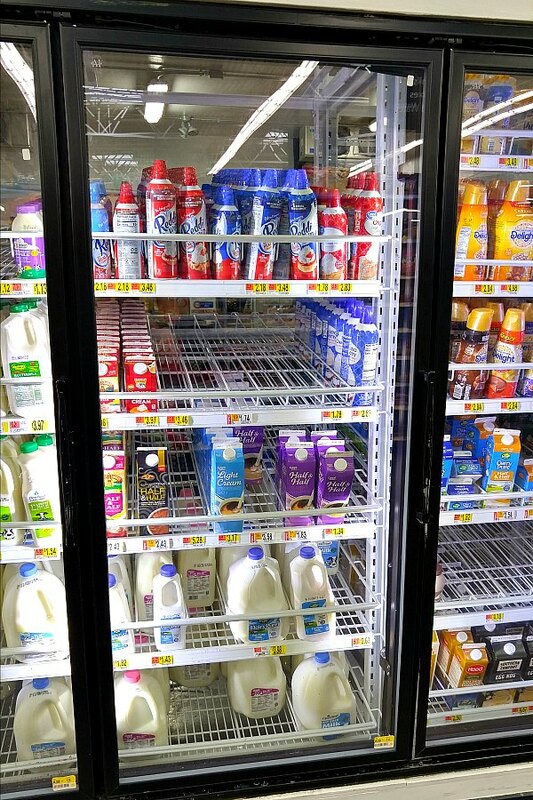 The next time you’re in Walmart look for it in the dairy section. What does one do with all the spines in the baby spinach? Baby spinach cooks down nice and tender so you don’t have to worry about cutting out the spines. Yes, you can make this ahead of time. You can store it in a covered container in the refrigerator and then heat up by microwaving or heating slowly over low heat in a pot on the stove. You can add a little extra cream if it begins to dry out.